She could not imagine, back in the 80s, when she ran a missionary hospital in Zimbabwe, that she eventually would fulfill her teenage dream in her sixties and as a religious missionary: To represent her country, Singapore, and get a medal at an international sports event. Sister Linda Sim won the silver medal at the “2013 Chuncheon Korea Open International Taekwondo Championships”. As a child, at age 7, little Linda wanted to join the army. Someone told her that she wouldn´t be allowed to, and started to think about joining the best “army” of all, God´s army: the Church. Meanwhile, in 1971, she enrolled in martial arts courses at the San Vicente de Paul church in Singapore. There she fell in love with Taekwondo. “My father didn´t want me to do martial arts, but my mother did; so she accompanied me everywhere. When I was hit in the head, she closed her eyes and wouldn’t open them until the end of the combat “recalls Sister Linda. During seven years she was devote to sports and got her black belt. In 1978, she felt God´s call even more powerful, and entered the novitiate of a missionary congregation, the Franciscan Sisters of the Divine Motherhood. After making the vows, she was sent on a mission to Africa where she managed a hospital for 3 years in Zimbabwe. Later, she was sent to England to work in the promotion of vocations and the formation of novices. She lived there 17 years and in 2004 returned to Singapore. 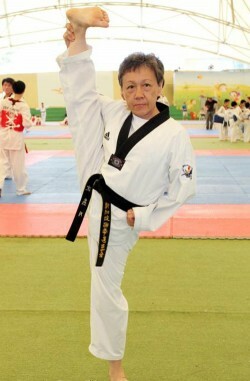 Throughout that time, she was very disciplined and continued practicing Poomsae, ideal to practice by her own. Back in Singapore, being manager of the Mount Alvernia Hospital, she decided to apply “Poomsae” to rehabilitation therapies for children with cancer, in a program supported by the Taekwondo Federation since 2006. 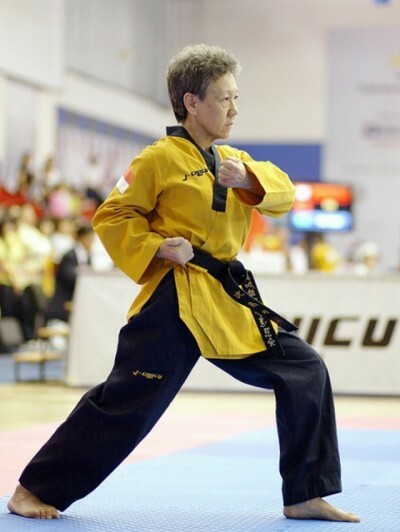 Sister Linda and the doctors have seen the benefits of “Poomsae” in younger children, helping them before and after chemotherapy. “To me” Linda says “it is a privilege and an honor to lead these children and learn from the Federetion coaches who are supporting us at the Saint Francis Hospice to give theoretical and practical Taekwondo classes”. Thanks to this program, “The Assisi Boys” won a championship in 2007 with-6 gold medals, 2 silver and one bronze. It was years later, in July 2013, when Sister Linda got her Silver Medal in South Korea in an international open: “I thought I was too old, but apparently I’m not yet,” she says laughing.